America's heartland is a combination of the ecosystems of the Great Plains and parts of the grand deciduous forests that extend into the northeast and mid-Atlantic states. Long known as the "breadbasket" of the world, the American Midwest is the greatest agricultural region on the planet, and its rich soils and growing conditions make it a wonderful place to garden with wild flowers. Optimum planting times for the region are mid-March to mid-May in spring, although you can plant as late as mid-June. Fall planting in October and November is also successful in all but the coldest regions. 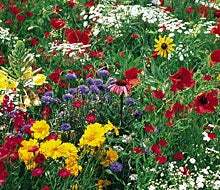 Our is one of our richest mixes of native and naturalized flower seeds, featuring the world-famous wildflowers from the plains regions, such as , and . Our is a premium blend of even more wildflower species native to the region. Over the last 25 years, we have helped literally millions of wildflower gardeners in the Midwest establish wildflower meadows they will enjoy for years.